Jet Airways will commence its second frequency between Mumbai and Kuwait. Jet Airways 9W 572 will depart for Kuwait from Mumbai at 2205 hrs (LT) and arrive at its destination at 0005 hrs (LT). On its return leg, flight 9W 571 will depart from Kuwait at 0105 hrs (LT) and arrive into Mumbai at 0715 hrs (LT). Does it make sense to have two flights on the BOM-KWI sector within an hour of each other? Delta Airlines in March 2018 is ending Newark – Amsterdam service, with last Newark departure scheduled on 23MAR18. For winter season, the Skyteam member operates this route 4 times a week, reducing to 3 in March 2018. The following schedule is effective for the month of February 2018. Jet Airways said on Wednesday it had agreed to buy 75 Boeing 737 Max aircraft, and that it could purchase another 75 to help it expand in a booming Indian market. Jet said in a statement that deliveries of the single aisle jets are expected to start in mid-2018 and a decision on adding an equal number of narrow-body aircraft "will be made over the coming few months". An order for 75 737 MAX 10 jets would be worth as much as $9.3 billion based on list price although airlines typically get discounts for large orders. Reuters reported in June that Jet, which is part owned by Abu Dhabi's Etihad Airways, was in talks to buy either Boeing's 737 MAX planes or aircraft from Airbus SE's A320neo family. Airlines in India have hundreds of aircraft on order as they look to tap into a market growing by nearly 20 percent a year thanks to rising incomes and low cost fares. Jet Airways has the second largest market share in India behind InterGlobe Aviation's IndiGo. It must be. Without the EWR-AMS in the winter, 9W's India traffic in AMS would suffer. I think the plan is let Jet fly year round BOM-AMS-EWR and DL will add a flight in the summer peak season EWR-AMS for US tourists (who might not want to fly 9W). AS a DL Diamond, DL not flying the route is a bummer. The EWR-AMS and EWR-CDG are the easier flights to get award seats and more importantly Global Upgrades. Jet Airways earlier this month expanded codeshare partnership with Delta, as 9W-coded flight numbers being added on additional 28 domestic US routes. Planned new codeshare routes from 16OCT17 as follow. Regarding the above mentioned code shares, especially to cities which are already served with a 1 stop connection (IAH, SFO, LAX, DFW, MIA) from BOM, DEL, BLR or MAA why would anyone connect through CDG or AMS and then again at ATL or JFK to take advantage of the code share ? Is it cheaper to book a code share flight ? 1) Routings from India often include two US destinations - so maybe this let's Jet sell more of those types of tickets? 2) It could be for those connecting on different flights from London. You might not be able to get to a city one stop if you miss the morning flight out of London. An example, my Mom uses Jet's morning departures from BOM to LHR instead of the 2:30am flight. She then connects to a late afternoon / evening flight LHR-JFK. Net net, pax want options and this let's Jet give them that. Jet Airways in winter 2017/18 season is adjusting operational aircraft for Delhi – Amsterdam route, currently served on daily basis. From 30OCT17, 2 of 7 weekly flights will be operated by A330-300 (Mondays and Thursdays), replacing 777-300ER aircraft. Anyone know why the 777 downgrade to 333 during peak season? Is it because of demand or because of aircraft maintenance? To allow the A330 from BLR to swap with the one from DEL. Regarding the above mentioned code shares, especially to cities which are already served with a 1 stop connection (IAH, SFO, LAX, DFW, MIA) from BOM, DEL, BLR or MAA why would anyone connect through CDG or AMS and then again at ATL or JFK to take advantage of the code share ? The DL codeshare on US domestics is probably for passengers from India who have one or several US domestic trips in their itinerary. This way, passengers who are planning to visit several cities in the US in one trip can plan his/her entire itinerary on 9W/DL. Jet Airways from December 2017 is expanding travel options to the United Arab Emirates, with new service launch on Goa – Abu Dhabi route. First flight is scheduled on 10DEC17, operating on daily basis by Boeing 737-800 aircraft. Indian airline Jet Airways is in "serious discussions" about ordering a further 75 Boeing 737 Max aircraft, having already ordered 75, chairman and founder Naresh Goyal told Reuters at the Dubai Airshow on Monday. It was not immediately clear whether the additional order would be announced at the airshow. The airline said last month it had agreed to buy 75 of the aircraft and that it could acquire another 75 to help it expand in a booming Indian market. Was trying to book a flight from BLR to CDG and return. Turns out AMS-BLR is fully booked in Y over the weekend. Not too shabby for a newly launched route. Finally booked outbound on BLR-MAA-CDG and in bound CDG-BOM-BLR. From the same anecdotal observation, can we conclude that MAA-CDG route is more affordable and easily available, which could mean that this route may not do well in the long run. At ur risk you definitely can. Currently sitting inside VT-JWR as it prepares to leave for CDG with a load of 89 passengers on an A330-300. The ground staff said the weekday loads are less than 100.Weekend is better. Jet Airways plans to do away with first-class seats in its Boeing 777 planes that are operated for long-haul flights as it works on cost-cutting measures, a senior airline official said. The carrier, earlier this week, told investors about its plans for strategic growth where the key focus would be on cost minimisation. According to the official, Jet Airways is looking at doing away with first class seats in B777 planes in order to increase the number of seats in them as part of larger cost reduction efforts. Currently, the full-service carrier -- in which Gulf carrier Etihad has a 24 per cent stake -- has 10 B777 aircraft. These planes have 8 first, 30 business and 308 economy class seats. In a presentation to investors on November 20, the airline said it would increase the number of seats in B777 planes, to around 400 seats from 2019 onwards, from 346 seats. Asked about how the airline is going to implement the proposed increase in the number of seats in its B777 aircraft, a Jet Airways spokesperson said the initiative is one among several measures being evaluated by the carrier. "The airline plans to increase seats in its B777s from 346 to nearly 400, as part of its continued endeavour to reduce costs and realise higher revenue in the foreseeable future," he told PTI in an e-mailed statement. Without divulging specific details, including the estimated cost for refurbishing these planes, he said the airline will share additional details at an appropriate time. As per the presentation, the carrier will look to reduce maintenance expenses from January 2019 as well as bring down cost of sales and distribution and also focus on enhancing ancillary revenue by around Rs 250 crore. Jet Airways has deepened its partnership with Air France-KLM beyond codeshare to create a “metal-neutral” agreement between the three airlines. The new agreement, which will effectively connect 44 destinations in India with 106 destinations in Europe, has an annual incremental revenue potential of over $1 billion (roughly ₹6,400 crore) for the Indian airline, Naresh Goyal, Chairman, Jet Airways, said, announcing the partnership here. Jet’s FY-17 gross revenue was ₹23,670 crore. For the current winter schedule, Air France-KLM and Jet will operate 64 weekly flights between Paris, Amsterdam, Delhi, Mumbai, Bengaluru and Chennai. The “metal-neutral” agreement means the airlines share revenues on these routes, regardless of which airline’s plane a passenger ultimately flies with – Jet, Air France or KLM. In essence, this immediately boosts the sales and distribution capability of the European carriers in India, while giving Jet access to a much larger passenger market in Europe. Air France-KLM’s two European gateways at Amsterdam and Paris are well-connected across the Atlantic through a similar partnership it has with Delta Air Lines, offering access to over 200 destinations in North America. Jet and Air France-KLM also announced a Memorandum of Understanding to strengthen joint cargo operations and expand capabilities in high-value cargo services, particularly in pharmaceuticals and e-commerce. Jet Airways in the first quarter of 2018 plans further codeshare expansion with Air France and KLM, covering additional points via Amsterdam and Paris CDG. Planned new codeshare routes from 15JAN18 as follow. On separate note, Jet Airways will codeshare on Air France’s Paris CDG – Bangalore route from 18DEC17. Jet Airways since late-November 2017 further expanded codeshare partnership with Delta, covering additional domestic routes via Boston, Los Angeles and New York JFK. Approximately from 20NOV17, planned new codeshare routes as follows. Jet Airways plans to induct 25 narrow-body planes into its fleet over the next three years even as it is yet to take a call on the delivery schedule of the Boeing 787 planes. The Naresh Goyal-owned carrier, in which Gulf carrier Etihad holds 24 per cent strategic stake, has 10 Boeing 787s on order, which were to be delivered from this year. "As per our plan, we want to induct in the next three years, from the next fiscal onwards, almost 25 narrow-body planes into our fleet," Jet Airways chief financial officer and deputy chief executive Amit Agarwal said told analysts in a post-earnings concall today. Agarwal also said the airline has already taken three Boeing 737s on lease as part of its plan to induct eight similar aircraft into the fleet this fiscal and the remaining five will be inducted by next March. "We are currently evaluating the whole wide-body long-haul network. Depending on that we will finalise the delivery schedule of the Boeing 787s," Agarwal said. Jet Airways had initially ordered Boeing 787-800s, but later switched to B787-9 variant. Jet Airways has added a pre-owned 737-800 to the fleet, as VT-JTK. I am sorry if this has already been reported here, but 9W now operates 3x daily BOM-LHR, all with the 77W. They are now the biggest operator on this route. 1) Jet doesn't use the main lounge in BOM anymore for J class pax - it's now the East shared lounge (I think that is what its called). Unclear if this is a downgrade or an upgrade or which airlines use this one. BOM airport was totally empty at 7:45am and it took only 15 min to get to airport from Bandra. Jet uses the First/Business class separate area for check in (last aisle). I seem to remember AF has someone meet J class pax at the main door to terminal where they check your itinerary. Jet did not have anyone walking you to check in (not that it matters - I just thought that was a standard at BOM). 2) Really liked Jet's J class seats. Much better than Delta and Virgin. They even have mattress pads although they are in the bins and you have to ask on your own to have them put down. 3) Jet doesn't give amenity kits on day flights (super weird) just socks (and no eye shades). How much does this really save them? 5) I like that they waited about 2 hours to bring out lunch on the BOM-LHR flight (you could ask for it earlier). The options on both flights were 1X Indian Non Veg, 1X Indian Veg, 1X Western Non Veg and 1X Veg pasta. My Indian non veg was served on china with the rice and Indian veg plated. The Chicken curry was in a bowl as was the Dal. Came with Indian bread as well. I also think there was raita, pickle, papad. I wish Jet would serve food like Turkish and AI First (back in the day). Just bring out a cart of Indian and Western food and let people pick. I think Indian pax would really like that. 6)They forgot my salad and soup (but caught it later and apologized). I think Jet should do a more structured service of serving the aps to everyone first then bring the mains. I guess many people eating Indian food don't ask for starters? I liked the Indian food served. 8 ) Staff was very nice but they don't walk around the cabin enough. They just turn the lights off and basically disappear. 9) At BOM they had both jet bridges connected to the plane but made F/J pax all board through the rear one (it's actually one of the nice things about BOM that it was built to allow two entrances Premium & Coach). Not sure why they don't use it. They also did the UK visa check on the jet bridge - seemed inefficient. Why not check visas at check in? 10) My AMS-BOM flight was oversold in J. Did not ask pax if they wanted to upgrade to F for say $300. They just upgraded people (I am assuming their FF flyers - which is totally cool). I think Jet should remove F and install a premium Y product. Both VS and AF have premium Y, so NA connections would work. Net net I liked Jet and would fly them again (I also flew them AMS-BOM on my way to India). They are not super premium like a SQ but are solidly up there with the biggies. They just need a bit more structure to their service. Kudos to them for giving more options between BOM-LHR. Long overdue. With their DL/VS partnership, BOM pax get a lot of options on arrival / departure times. You can basically avoid those late night departure/arrivals if you want (well at least NYC pax can). Oh their partnership with DL/KL/VS/AF seems to be working great. Tons of connecting pax on both the LHR and AMS flights I took. If people are debating where to connect, I would say AMS is the best to connect through (9W is near KLM gates and KLM manages the flights there - although 9W is not on the DL/KL computer system). LHR, while requiring a bus to change terminals, is fairly easy - very clearly marked for transfer. CDG is probably the worst - it's a far transfer between 9W's gates and DL/AF USA flights. Plus its confusing, lots of walking/stairs and not the nicest airport staff (sadly). Thanks for the info Caliguy. Full flight, the BOMLHR one? Causal Determinism : We are hardwired to need answers. The Caveman who heard a rustle in the bushes and checked out to see what it was, lived longer than the guy, who assumed it was just a breeze. On what routes does 9W deploy its 2 x 739 (non ER)s ? ^^ They usually fly them to RUH/JED, BKK, KTM and BOM-DAC. In addition, some peak domestic routes (BOM-MAA, MAA-DEL) or some short flights out of BOM (IDR, BHJ, IXU). Domestically I guess it is anyone's guess, but the international flights to KSA, Bangladesh and Nepal are pretty set. Thanks. BOM-BKK shows equipment as 737-900 so I was wondering if its the "pure" or the ER variant. It is actually pretty strange to see 9W operate the high-J B739s on routes those are not BOM-DEL-BOM, seeing as that is what they did for a long time. Bigger surprise is seeing it operate the red eye on BOM-CMB-BOM. 9W goes double daily on BLR-SIN from 25th Mar. Late night departure from BLR. 9W is pulling out of BLR-CMB with last scheduled flight slated to be on 31st Jan.
Indigo caused 9W to pullout ? They could try some domestic connections - TRV/COK/IXM/TRZ. If they had flights leaving these stations at 10 PM, and early morning flights to these stations, it could work well. This year, while researching BOS-TRV fares, AI and 9W show up quite a lot. This is a change from years back, when only the ME airlines would show up. Jet Airways has added a pre-owned 737-800 to the fleet, as VT-JTN. Jet Airways has completed leasing plan of eight single-aisle Boeing 737s, which it had announced early this fiscal year. With the induction of the eighth and the last B737 Next Generation plane today, Jet Airways fleet size has now grown to 119 aircraft. Also, this is the last B737 for the airline as it will now start taking deliveries of 737 Max, the latest single- aisle jet from the US aircraft maker. "We have inducted the eighth and the last Boeing 737 in the fleet today and with this, we have completed the process of leasing of eight such planes in the current fiscal year," a Jet Airways source said. When contacted, an airline spokesperson confirmed the development but did not divulge other details. "Our new fleet of Boeing B737-Max will come from June 2018 onwards. This year, we plan to take anything between six and aircraft from the open lease market and induct them into our fleet, primarily B-737NGs," Jet Airways chief financial officer Amit Agarwal had said last May. Jet Airways is set to pull out daily direct services on the Kolkata-Port Blair and Kolkata-Bagdogra routes from March-end, a top Airports Authority of India (AAI) official today said. "Jet Airways has informed us that with effect from March 25, they are withdrawing Bagdogra and Port Blair flights from Kolkata," the official, who did not wish to be named, told PTI. Travel industry sources said that profitability was the key reason behind the move. Jet Airways has been operating flights on the routes for around five years. An e-mailed query sent to the carrier did not elicit any response. Saw a 9W 737 at AUH with an Audi Roadster decal. Possibly VT-JFC. Any pics of the same? Jet Airways is likely to close the order for another 75 narrow-bodied planes by the end of this month, chief executive of the airline Vinay Dube said on Thursday. 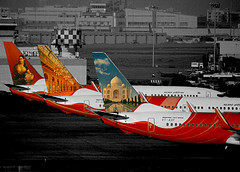 Dubey also said the airline has not officially cancelled its order for Boeing 787. Jet Airways first 737-8 Max frames are coming soon.